My last post was about an excellent English Breakfast tea from S.D Bell's. 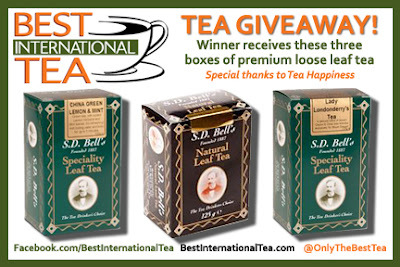 The US distributor Best International Tea has generously provided us with a fantastic giveaway. The lucky winner will get three boxes of their loose tea! English Breakfast, Lady Londonderry and China Green Lemon & Mint. after you do that, leave comment on this post. You can also enter by commenting on the same post on my facebook page to double your chances! Entries will be accepted until Midnight on November 26th. Winner will be announced on the 27th. Best of luck to everyone! This is a great giveaway, so don't miss out! I've done all those things and now sitting hopefully with my empty tea cup! Thanks for the chance. joined with the give away as mentioned,also commented under facebook page post....Thanks for hosting!! I liked and follow. Great giveaway!